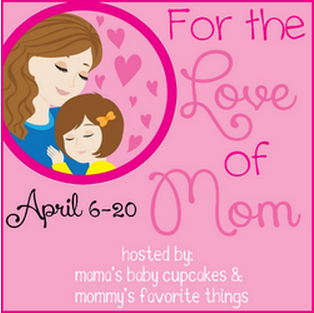 Welcome to the "For the Love of Mom" Giveaway Hop hosted by Mama's Baby Cupcakes & Mommy's Favorite Things. The theme of this event is great gifts for mother's, and each blog participating has a prize valued at $25+. This hop is April 6-20 and your winnings arrive just in time for Mother's Day! Secrets of Tea is a small, family owned craft tea blender. Their teas are based on family recipes passed down from one generation to the next. Their teas combine ancient knowledge with modern botanical research to create the perfect, purposeful blends. Each is carefully formulated with the finest ingredients to create delicious brews infused with nature’s healing gifts. Parenting – and especially motherhood – is a beautiful blessing. But it requires giving of yourself disproportionately. These organic herbal tea blends are infused with nature’s healing gifts. Wholesome, natural remedies to help alleviate issues during pregnancy and the entire maternity cycle. 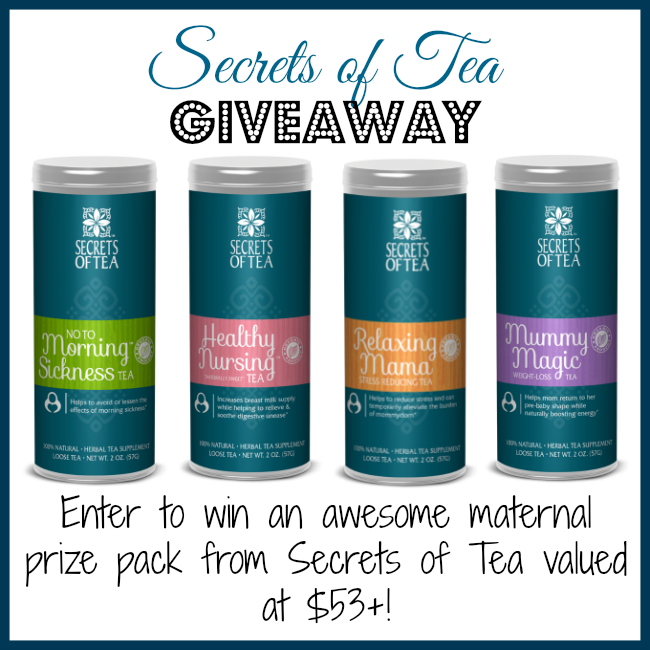 Secrets of Tea has kindly offered a wonderful prize pack for moms or moms-to-be! Their most popular blend. No To Morning Sickness is a tasty pregnancy tea with safe ingredients for mom and baby. Get morning sickness relief by giving your body the essentials for a healthy pregnancy with the sweet and smooth flavor of No To Morning Sickness tea. This herbal tea is all natural. It has no preservatives and all the ingredients are 100% safe for mom and baby. Enhance the quality and quantity of your breast milk production while nursing with 100% natural herbal tea blend. By delivering a nutrient rich blend of vitamins and minerals through you and your milk the time-tested ingredients encourage your body to produce more and “healthier” breast milk for your infant. Healthy Nursing Tea is a natural and organic tea with no caffeine and no preservatives. Designed to help nursing mothers increase breast milk production it's also infused with calming ingredients to alleviate mom's stress too. Every parent, especially mom, needs a break from the daily grind of being a parent – even if for just a short while. Their Relaxing Mama herbal tea combines all natural ingredients that help you unwind your body and mind. 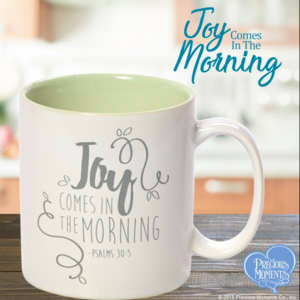 So enjoy a cup and let go of the stress you encounter every day caring for your children. With each cup you'll also be enjoying a healthy dose of antioxidants too. This caffeine free organic herbal blend helps to stimulate your metabolism while also providing a natural energy boost. It's a terrific way to enjoy a healthy daily beverage with the added benefit of encouraging weight-loss after delivering your baby. The retail of this amazing prize pack is valued at $53.80! Entry is simple! Just follow the prompts on the Rafflecopter below! And make sure to follow Nanny to Mommy on Facebook so you stay up to date on all of our fun giveaways! 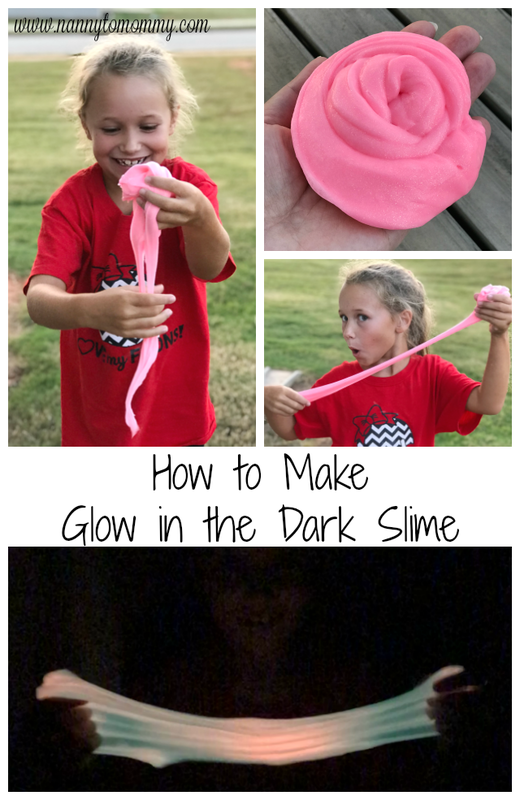 Nanny to Mommy did not receive anything to share this information or giveaway. I just thought you all would really like it! Secrets of Tea is sponsoring this giveaway and responsible for prize fulfillment. Open to US only, Must be 18+ to enter. One entrant per IP address. Winner is chosen via Random.org, al winning entries are verified. I'd like to try relaxing momma! What a great giveaway :) Looks wonderful for all the mommies out there! Thanks for hosting! what a great giveaway! 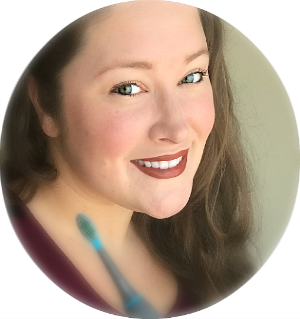 I love all the products! Thanks! I'd totally get the Relaxing Mama that is something I definitely could use! I ADORE tea! I used to be a tea blogger! What a wonderful niche they have found! Relaxing Mama would be my best pick!!! I'd be most interested in the Mummy magic to help shed those baby pounds! The Mummy Magic tea sounds really interesting, I'd love a little extra help in getting rid of the baby weight. I'd be really excited to try the Healthy Nursing tea. I sometimes worry about my supply and it's always nice to have a little support! Im most excited for the Relaxing Mama tea!! Cuz lets be hones, all us mama's need some relaxation!! id love the healthy nursing! always need help keeping up my supply!! i definitely need the Relaxing Mama. The Mummy Magic is the one that I'm especially interested in trying. I am suffering from a total lack of energy right now. My sister just found out she's expecting, so i'd love her to try the no to morning sickness. I would love to try relaxing momma. I would love to try the Carmelita chickory spiced tea product. It sounds so good. I'm most interested in Mommy Magic. my wife would like the Healthy Nursing Tea. The magic mummy tea for sure. They all look great! I could really use the healthy nursing tea. I would love to try the Relaxing Mama tea. I'd be most excited to try the nursing tea, as I am due in a few weeks! I would love to try the mummy magic. Anything to help boost the energy level! I am excited for the mummy magic! The morning sickness tea would have been very helpful early in my pregnancy! Mummy magic. Ugh, metabolism problems! I would love to try No to Morning Sickness, since it's something that I'm dealing with right now. The Relaxing Mama for sure! I would love to try Mummy Magic! I am most excited to try relaxing Mama the most.